Following on from the success of our competition in 2012, I'm pleased to announce the second Tantalising Textiles Competition. This year's theme is 'Wish You Were Here'. I want to encourage people who have never displayed work before, as well as established textile artists, to submit their work for entry into the competition. All entries will be displayed in The Gallery at Craft Arena between Saturday 1st June to Sunday 30th June 2013. As last year, judging will be by members of the public and the artwork with the most votes will win a prize. There will also be a separate prize draw for the voters. There will be a nominal £5 charge for each entry with the monies raised being divided between the prizes and a donation to St Luke's Hospice in Basildon. Closing date for applications is Sunday 12th May 2013, and all entries submitted will be displayed in The Gallery at Craft Arena from Saturday 1st June to Sunday 30th June 2013. Entry forms are available in store, online or email me for a copy. 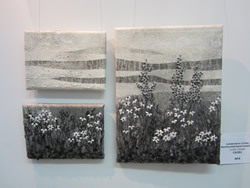 Entries can include any type of Textile Art; Mixed Media, Fabric Collage, Embroidery, Cross Stitch etc., but must not have been exhibited before. 3D items can also be submitted. The maximum finished size should be A2 (594 x 420 mm) for hinging items and 400 x 200 x 200 mm for 3D items.